Is RED your corporate colour? Week 2 of 6: Red Promotional Products! Check out our fantastic range of Red Merchandise items to match your corporate colours. Create maximum brand exposure with your corporate message printed on a stand out promotional item at a great cost. Select from our wide range of Red Promotional Products such as Red Anti Stress Toys, Embroidered Red Caps, Red First Aid Products and Printed Red USB Drives. Affordable advertising is the key to great brand recognition; take a look at these great items below to enhance your logo! Red Anti Stress Cubes: Make memorable promotional products that can be custom branded with your logo. Ideal to keep on your desk or at home for those stressful days! This Corporate Red Anti Stress Toy can be printed on a number of sides to get your corporate message out there. Choose a cost effective merchandise item that matches your corporate colours today! CPR Mask Keyring: Promote your safety message with Vivid Promotions' Red CPR Mask Keyrings! This fantastic promotional product can display your brand wherever you go and can conveniently clip onto your keychain, pocket or bag. You never know when a CPR Mask might come in handy! 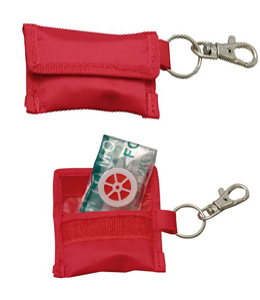 Screen Print your logo onto the corporate red pouch and enhance brand exposure. Corporate Red Cap: Check out Vivid Promotions' Red Vertek Caps with contrast side panel and peak design. This structured 6 Panel Cap Can be printed or embroidered with your company logo at a great price! 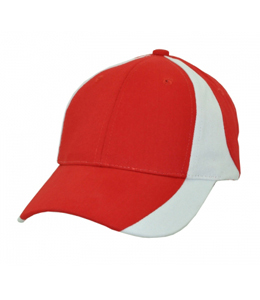 Presented in Red/White, Black/Red and Navy/Red along with many other colour combos; this low cost Heavy Brushed Cotton Cap is a great promotional item for all ages. Mix N Match USB Drive: Select a USB Flash Drive to match your corporate colours such as a Red USB. 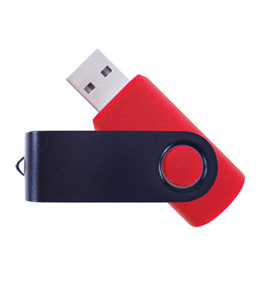 This low cost Flash Drive can be customised to suit your needs with a red rubber base and aluminium swivel, or mix N match for a unique look. Engrave or pad print your logo on our cheap USB Flash Drives. Featuring free data upload to 150MB, this handy USB is a great office product. Promote your brand along side your corporate colours with Vivid Promotions RED Promotional Products. This week, our colour is red - check out some of the above merchandise items to match your logo or select from our wide range of Promotional products that are also available in red. Red Backpacks, Printed Red Drink Bottles, Corporate Red Pens, Branded Travel Mugs, Red Calculators with printing and Corporate Golf Umbrellas just to name a few. Incorporating your brand name and corporate colours are sure to gain great brand exposure wherever you go; By choosing an affordable promotional product to match your red logo you will not only receive a great response from existing clients but potential clients too! Contact our friendly sales team on 1300 72 70 92 for more information and assistance with your next promotional campaign. What a great quality arlcite! 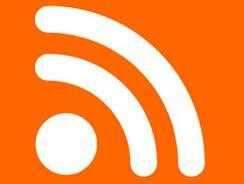 This is awesome content with thoughtful viewpoints and persuasive content. I\'ve learned some new things about this subject. I am totally impressed with your writing style and presentation. Thank you. It is very helpful and important. I like your brand.